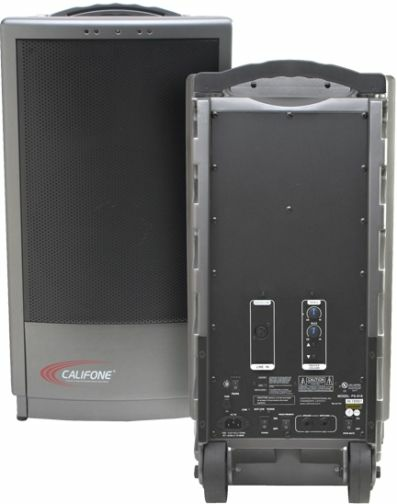 The PA919PS is a portable, wireless PA speaker that can double as a stand-alone speaker or companion speaker for all Califone PowerPro™, PresentationPro™ and PA419 wireless speakers. Designed for use in school, rental facility, sporting event and other settings, its 90 watts of power can reach an audience of up 1,000 people or a crowd of up to 2,000 people in larger-sized venues when paired with a master or non-powered support speaker. Its flexibility and versatility are ideal for any budget or situation as it can be used in a variety of applications and to extend PA coverage for voice and audio amplification. It includes an XLR line input and one built-in 16-channel UHF wireless mic receiver for transmission between an unlimited number of wireless PA319, PA419, PA919, PA919SD or other powered companion speakers when tuned into the same frequency channel. Two ¼” speaker out jacks allow for connection to a PA919SP or other non-powered support speaker. Its 10” high-powered woofer is driven by a beefy 40 ounce magnet (the most efficient in its class) and a high-frequency compression driver for optimal audio reproduction. The PA919PS also has independent bass and treble controls, a power status indicator, digital master volume control, operates on both AC and DC power for flexibility, and is fully operational when recharging. It's built with a durable fiberglass-reinforced polypropylene enclosure, has a rugged powder-coated perforated steel grille and a telescoping handle for easy transporting. Its voice priority switch will provide a mic override of background music for important announcements while the voice music switch adds emphasis to voice frequency range for longer range projections.